Going barefoot works by reawakening a light, natural stride in the body, through the feedback we get from our feet touching the ground. There’s less impact and joint torque than in a shoe, it reawakens muscles that have atrophied in our shoes, reawakens nerve endings and our balance system, stimulates reflexology points on the bottom of our feet, and even has anti-inflammatory benefits through grounding. This all means a stronger body, less joint pain, better posture, more mobility, greater health, and greater freedom. Going barefoot is like discovering a new fountain of youth. When our feet, knees, hips and backs are no longer in pain, we’re more likely to be active again. You’ll feel younger, your body will act as if you’re younger, and you’ll be stronger and more active than you’ve been in many years. Your mind will become sharper and your concentration better focused. By feeling the ground, people begin waking up the vestibular system (balance system) of the brain, stimulating new neural connections and remapping their minds for greater balance. For seniors this is critical, because one fall or hip fracture can lead to a gradual decline in health. 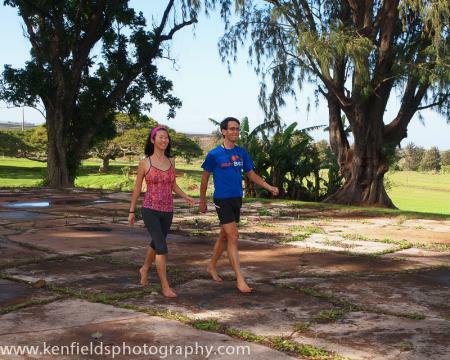 ​By going barefoot one begins to wake up new muscles, both for balance and support. Not only that, but if you look at a super-model’s legs, chances are she’s been walking barefoot at the beach, toning ALL of her leg muscles in the process. ​The body works on the use it or lose it principle. Use something, you get to keep it. Don’t use it, and it atrophies. When people start going barefoot their feet reawaken and begin to strengthen again. The corollary to this is less foot conditions. ​As the feet strengthen, plantar fasciitis diminishes, foot neuromas go away, bunions begin to dissipate and other conditions such as hammertoes go away. Even the arthritic foot begins to slowly heal itself as it develops greater strength, flexibility, and blood flow. Going barefoot not only wakes up long-dormant muscles of the feet and legs, but gets more blood flow to the feet and legs to get them going. This increased blood flow means less aches and pains, less varicose veins, and warmer feet and legs in the winter. ​We’ve all learned an unhealthy habit, or pronounced pelvic-tilt from a lifetime spent in a traditional shoe. The typical running or walking shoe isn’t just a shoe, it’s a high-heel, sporting a heel of 1-2 inches (if not more) in height. To keep from falling over we’re forced to get our butts back and bend forward at the waist, straining our hamstrings, lower back, upper back, shoulders, and neck. It also puts a lot of force on our hips, knees and feet when we run. Once we’re out of a shoe we can begin to reverse this. By feeling the ground the nerve endings on the bottom of our feet begin to tell us that we’re leaning or tilting forward, or that we’re bending forward at the waist. With practice we run, walk, and even stand with better posture, more like a dancer or a model. Not only do we look better and get taller, but we greatly reduce all of the stress and strain on our bodies. And all without any additional work! ​With childhood diabetes and obesity, kids health is at an all-time low. And health begins with the feet. If you have strong feet you can walk, run, bike and more. But with weak painful feet, there’s no desire to exercise. The American Podiatric Medical Association now recommends keeping kids out of shoes for as long as possible, because they know shoes weaken and deform the feet. Keep them out of shoes and kids stay healthy. Not only that, but the act of feeling the ground strengthens their senses and helps remap the brain. According to Dr. Merzenich, one of the nation’s leading neuroplasticians, barefoot stimulation helps improve memory, focus, concentration, and overall intelligence too! ​Studies show that by stimulating the nerve endings on the bottom of the feet, we can decrease blood pressure and the parasympathetic (cortisol) fight or flight response of the body. In other words, we decrease stress and inflammation throughout the entire body. ​Last, but not least, and perhaps most importantly, going barefoot has been shown to reduce inflammation. According to many new studies, inflammation is the number one cause of disease in the 21st century (from allergies to Alzheimers, arthritis to Autism, cancer, cardiovascular disease, diabetes, asthma, anemia, lupus, MS, and more are ALL related to inflammation). One possible solution may be grounding or earthing, the process of reducing inflammation by walking, standing or even sitting barefoot on the ground. Studies have shown that free radicals, the pesky buggers responsible for inflammation carry a positive charge. Though these positively charged particles play an important role in our immune system and the healing response, if we don’t have a way to drain them, they build up in our bodies, creating excess inflammation and cell/tissue damage. Meanwhile, the earth naturally carries a huge negative charge. (That’s why all of our appliances are grounded.) This difference in polarity or charge between your body and another is why you get zapped in the winter when you touch another object. It’s your body’s way of discharging this unwanted charge. Direct contact with the ground also allows us to discharge free radicals. ​Reflexology is the process of stimulating nerves on the bottom of the feet to stimulate the immune system, reduce inflammation & pain, reduce blood pressure, reduce stress and tension, and to stimulate many other healing processes in the body. Studies have shown great reflexology benefits to going barefoot and stimulating the soles of the feet.